Kev Adams meets Foundry = Warmonger! 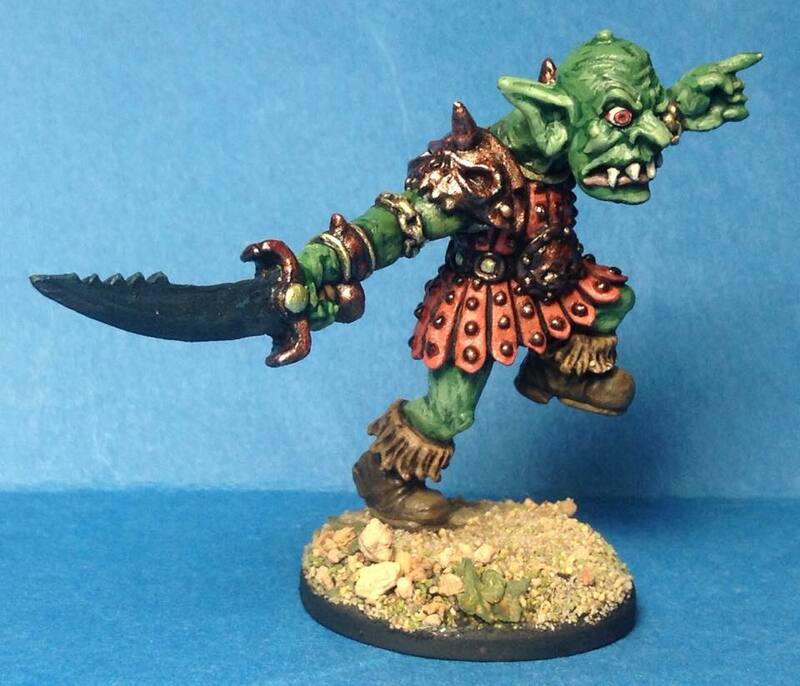 I had the great opportunity to meet up with Kev 'Goblinmaster' Adams at Salute recently. Great bloke and wonderful sculptor who brings the old school into new school. 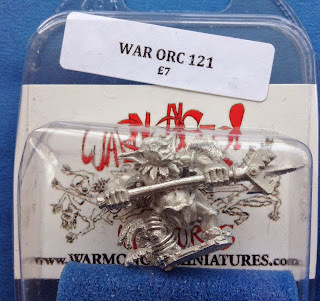 Bryan, Diane and Marcus Ansell are heading up the new Warmonger range that promises to be 'wow'!! 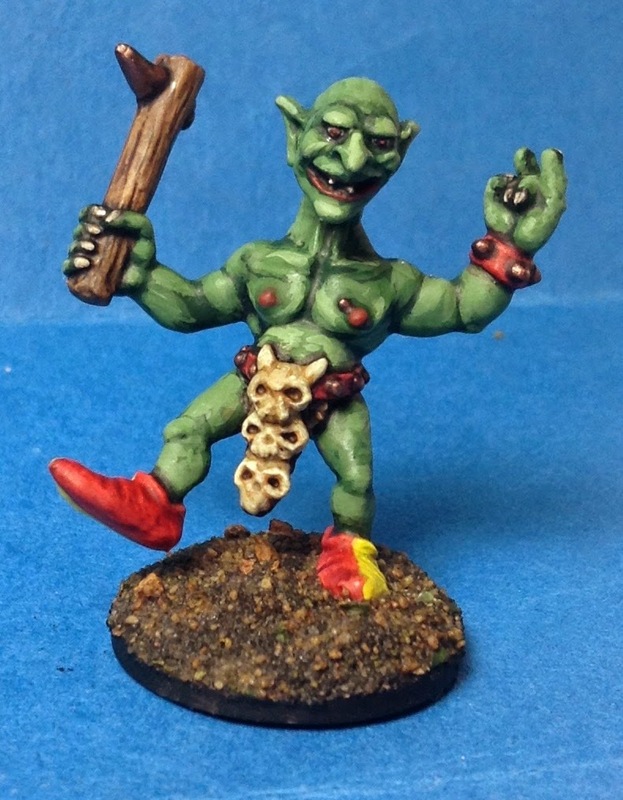 I picked up a set of the latest sculpts and have managed, post divorce and house move, to finally paint a set of the Goblins. Now, as per previous posts, they have many, many more greens to mold up and I look forward to them all......keep a lookout on their Facebook page here. Edit II - more painted! 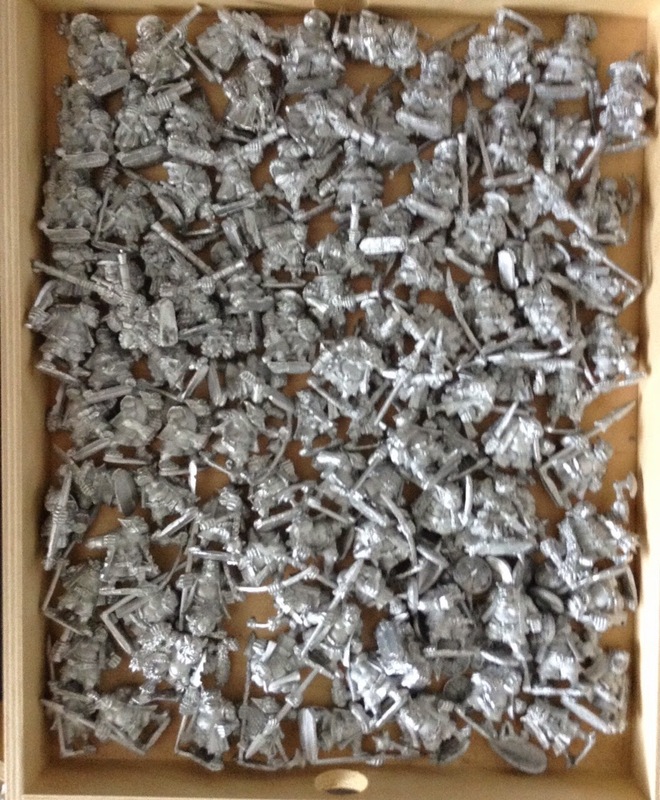 I do have a bunch more including some basic conversions where I've managed to pick up duplicates but...following the house move....they are nowhere to be found....doh! If you do contact people via me please mention my blog....I like to push it where I can and publicity is always good hence my latest investment.......excuse the non-ironed look please! The Lure of the Lead - an interview with Tony Ackland.. The Lure of the Lead……………..an interview with Tony Ackland, Sculptor of the Arcane…..penned by one David Wood, commonly known as The Dozing Dragon across the net. I was recently given the great opportunity to interview one of the cornerstones of the industry; the one and only Tony Ackland! It started with some general queries and built up over the course of a few weeks so please excuse me if the layout is none too professional! DW I am trying to get details and/or pics of the old sculpts you did for Fine ArtCastings in the early 80s - was the 25mm range ever released? TA The 25mm range was never released. The two main figures I did for them were the Equestrian Portrait figure of Lord Mountbatten and Chris Achilleos' original Raven cover. I think they were both 120mm but I can't be sure. There were a few ECW figures and I can't remember how many or the size, except that they were larger than 75mm. 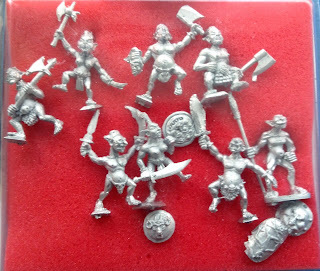 Then there were the 60mm fantasy figures. Both the ECW and the Fantasy ranges were extremely rushed. 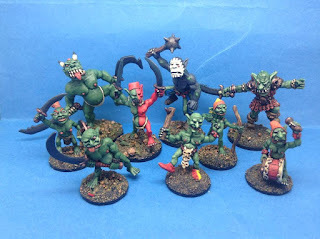 Some of the latter had less time spent on them than I would normally have taken on a 25mm. It all had to do with the money or lack of it that I made out of those jobs. The eagle from the Raven figure was remodelled and used as a mount for the Citadel elf lord. The first company I sculpted for was Asgard and then a range of 15mm fantasy D&D monsters and a few 25 mm SF figures for Tabletop (Games) Miniatures. 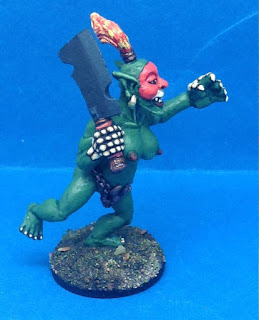 Do you treat Black Tree Design miniatures as Harlequin miniatures? 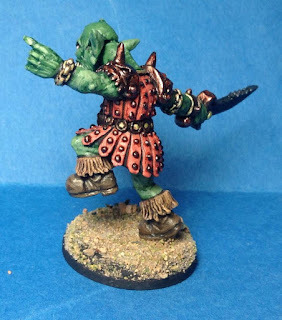 DW The Lost Minis WIKI does although I would not myself but then I am a little obsessive like that - they went through a number of name changes over the years! TA Although run by the same people they were technically different companies. 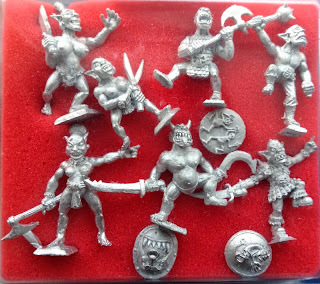 They were--Harlequin Miniatures, Icon, Black Tree Design. As I designed the logos for the latter two, I very familiar with the companies. Nearly as convoluted as the history of John Robertson's companies. TA How do the giveaway figures I designed for various Partizan shows figure in to this? DW I think I've got them all up on the Lost Minis WIKI. TA There was the stuff I did for the original Heartbeaker miniatures and a couple of plastics I did for Target games, when they took over Heartbreaker. None of the original Heartbreaker figures are in production, have no idea what happened. There are the straight line models I did for Sloppy Jalopy, but they are based on historical prototypes although they are primarily intended for use with alternate history games set in the 1920s and 30s. Facebook link. 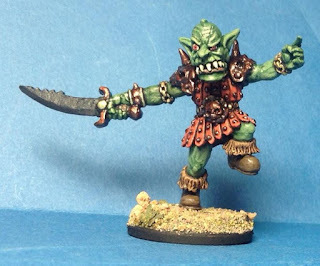 DW Do you have any pics of earlier models? TA Unfortunately not, I left nearly everything at GW when I left, even the pre Citadel stuff. DW I do remember seeing a sculpt for a woolly mammoth when I visited Lenton in the early 80s - was that yours? 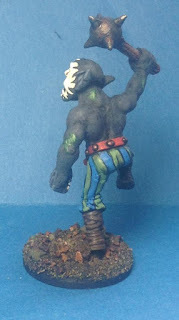 TA Didn't do a mammoth till Harlequin and that had all sorts of casting problems. Shame there is no record of the Asgard stuff. Tabletop Games bought the moulds. Trouble was instead of using a master when remoulding they used production castings. 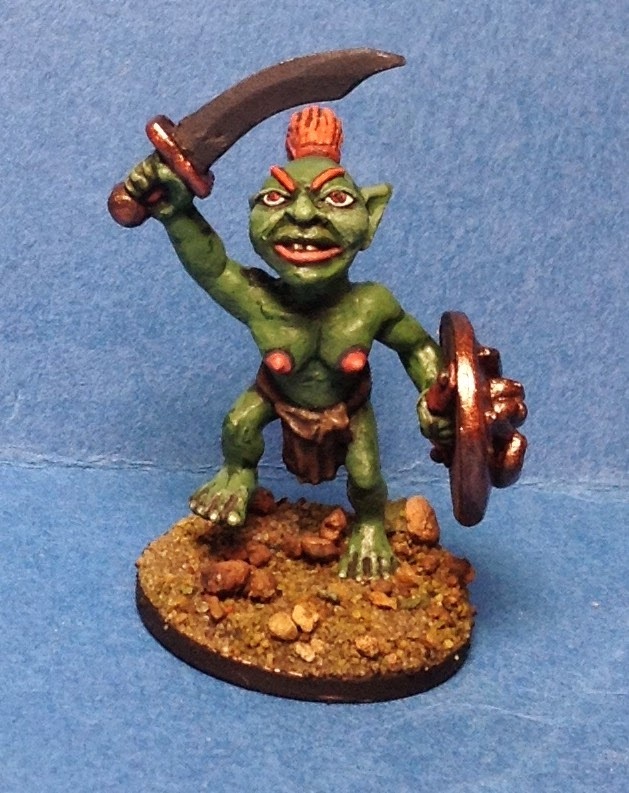 The result was that the miniatures became progressively flatter and softer. There were a few figure I did for Citadel in the early days besides the jetbikes and robots I did for their Spacefarer range. DW How did you first get into sculpting....or did the artwork come first? Can you remember your first commercially released sculpt? TA I had always done artwork on a semi professional level. Back in the seventies I was a member of a small wargames club which used to run a military modelling/wargames shop on Friday evening and Saturdays. We were just up the road from the main wargames club which provided our main customer base. We were then mainly wargaming Napoleonics, a couple of us were getting fed up with the fact that the figure ranges were incomplete. So we decided the only solution was to make our own. The folks at Greenwood and Ball were very helpful with advice and even supplied us with some master metal. We then met the Asgard guys at a wargames show, and as they were just starting out, they were interested in finding new sculptors. 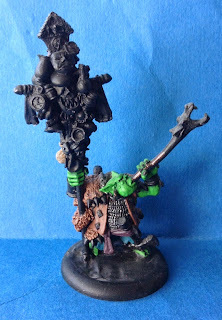 The first figure was the mounted Lord of Chaos for Asgard. It was a somewhat large figure for the time. Back then quite a few sculptors got into it to fill the ranks of their own armies. 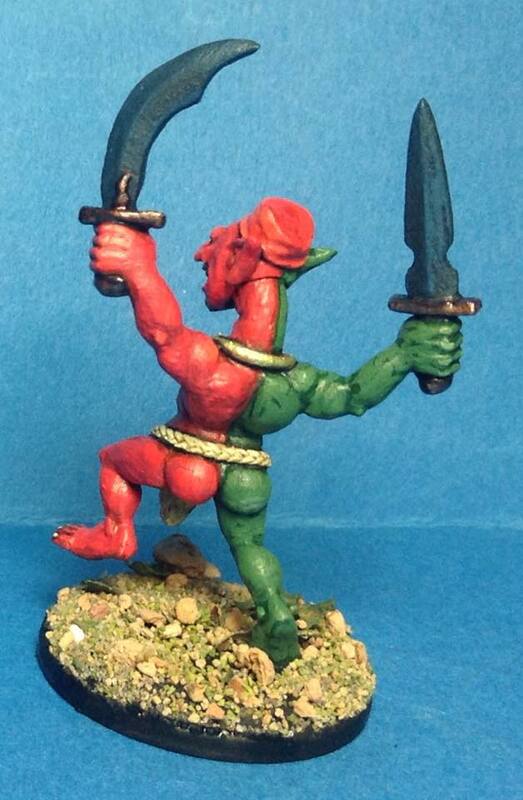 DW That Asgard mini is one of my favourite early sculpts - I always thought Bryan Ansell had sculpted those in that style - I hadn't realised it was you. I'm still trying to pick up a good copy after all these years...no idea where my original one went to. What was it like working with Asgard - did they have a 'design studio' set up of any sort or was it all freelance? TA Asgard was a rented garage in Arnold (just outside Nottingham) and Bryan's terrace house. Apart from Bryan the rest of the sculptors were freelance. I used to produce my own masters using RTV moulds as I got paid more than if I delivered a Milliput sculpt. Green Putty had yet to make an appearance. I also used to provide pieces of promotional artwork for them. Around the time that Bryan was preparing to sell out his share a certain Tom Meier paid a visit and introduced Green Stuff to the UK. 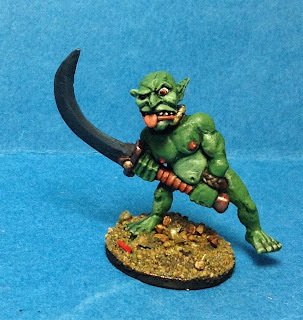 Bryan had a variety of plans but chose to buy into the newly formed Citadel Miniatures which Ian and Steve were forming primarily to produce Ral Partha miniatures under licence. DW So were you working to plans or just kind of making it up as you went along? TA It was pretty much do what you wanted. Everybody involved was into Fantasy and Science Fiction. I can't remember many of the figures I did around that time. I do recall doing some female figures, and giants. Also most if not all of the horses were mine. DW I know you sculpted for Fine Art Castings around that time - was there any other small company you did work for? TA Fine Art Castings was later. It was all pretty well a part time venture for me in those days. When Citadel was formed I moved over to doing the odd figure for them. The original idea was that Citadell's own figures would be compatible with the Partha range. But then Ian discovered the Perry twins and thus the house look for Citadel was born. Some of the figure I made for them were used by the company, some were sold onto another American company whose name I can't remember. Then Bryan disagreed with some of the directions that Ian and Steve were taking and he left to join Bob at Tabletop Games. DW Another American company? I'll have to research that! 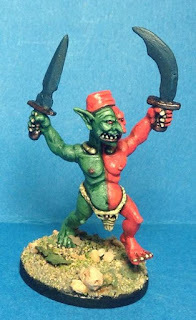 Do you remember what type of sculpts they were? TA The only two I remember were a ninja and a magic user. The trouble is there were lots of small short lived companies in the States at that time. Needless to to say it was through Bryan that I got involved with Tabletop. It was what Bryan referred to as his year off. Bryan was more ambitious than Bob which led to some disagreement. TA At the same time the fortunes of Citadel were slipping, and Steve and Ian asked Bryan if he would return to manage the company to try and get it back on its feet. It was during the Tabletop period that I also became involved with Fine Art Castings. And then shortly after Bryan returned to Citadel he asked me if I would be interested in working full time to edit rules, illustrate catalogues and do the advertising. As it happened it was Rick Priestley who eventually took over the editing. At that time Bryan intended to move on after a year or two. It was planned that eventually Rick and myself would move down to London and join the GW staff down there. But as Citadel became the most successful division of Workshop those plans all changed. DW I remember hearing that a Ferrari was involved in Steve and Ian asking! How big a part did your sculpting play in the 'new' Citadel? TA Not a lot. My main involvement with miniatures was in creating the concepts for the Perrys to work from. Previously a random selection of sources had been used. The idea was that I would provide some continuity of style within each range. This was done sometime by developing ideas from existing figures or creating new ideas. I did some one of figure work but they were one offs for private clients not intended for mass production, and none of them were fantasy. 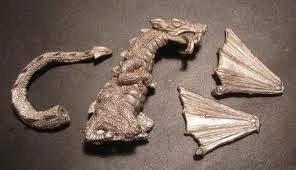 There is however the how many versions of Citadel castings of Tom Meier's Imperial Dragon were there episode. 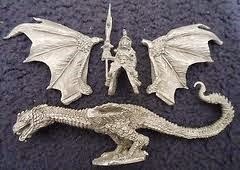 DW There were different versions of the Imperial Dragon? TA Tom invited the Perrys and myself to add items to the treasure mound on the master castings. As items were added at different times during tje making of the production moulds there were has I remember three versions. I remember one of the things I added was a MP40 machine pistol. Tom had included an umbrella and a toaster. DW I would guess they would only be on the English castings? I'll have a look as I have a couple of the US ones.....both were in sealed boxed from new....when I opened them a couple of years ago one was missing the tail...... I always loved the sense of humour in the early Citadel miniatures; something I believe has gone now with the 'corporate' image. TA Those were the English castings although the anachronisms that Tom put in are in the American castings. They do need a close look to find. DW How did the TA Machineries of Destruction come about? TA The TA range was a private venture within the company. It was agreed I would able to do projects outside my normal commitments and be paid a royalty for them. It was a very different set up then than the corporate entity it would eventually become. 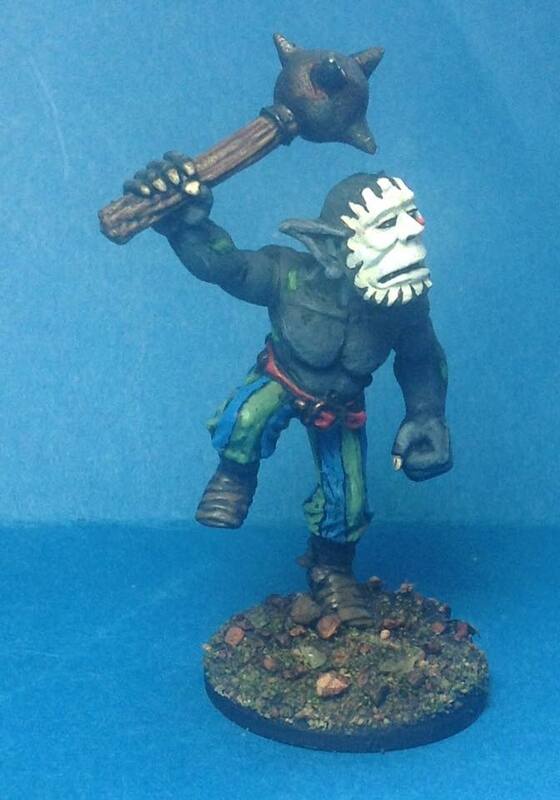 DW I do have a few different copies of the Ral Partha giant for the elephant - were you involved in those? TA Had nothing to do with the elephant. 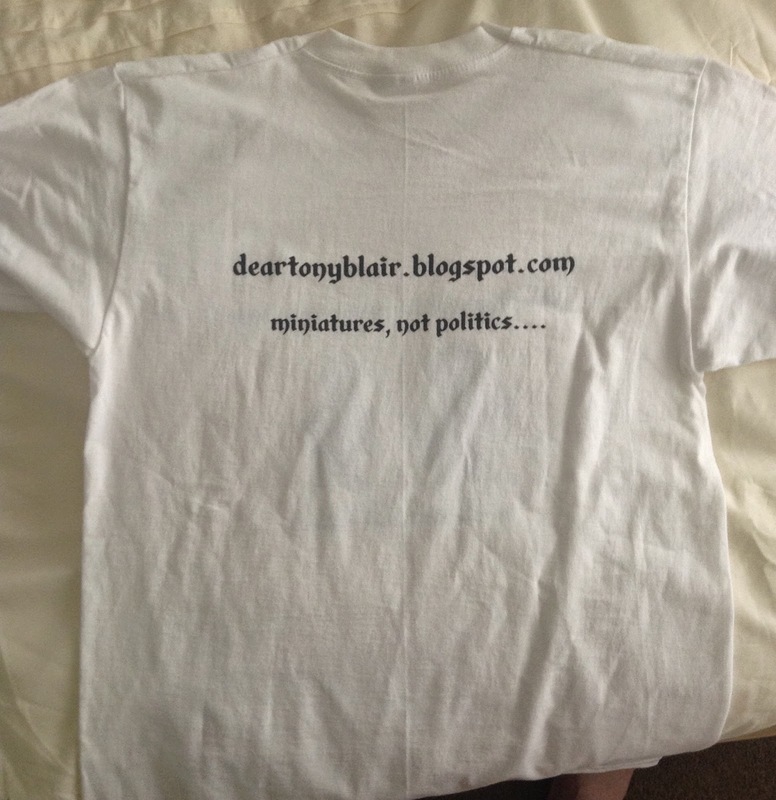 in the TA range or any other for that matter! 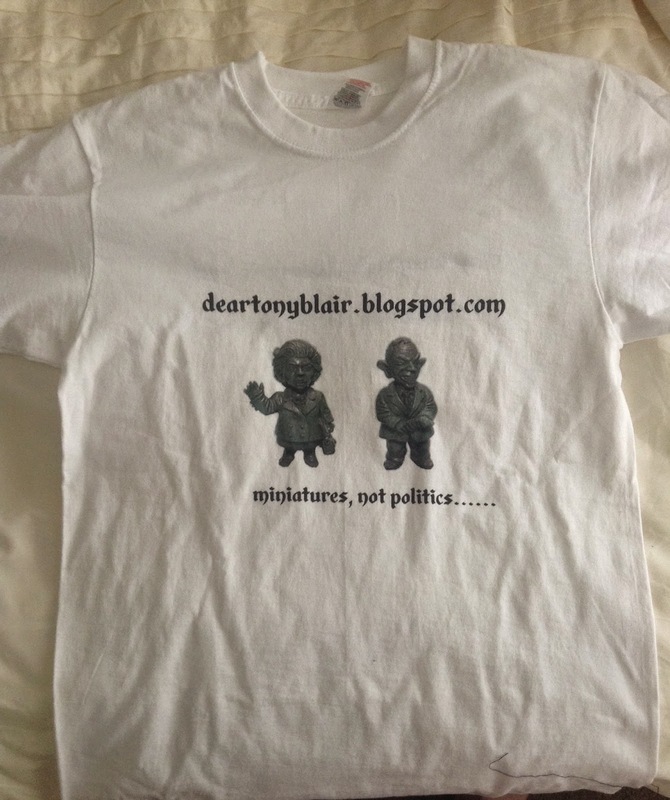 TA All the TA stuff was released, shame they are no longer available. 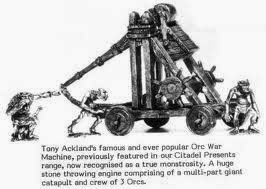 I'd love to get my hands on one of those Dwarf War Machines. There was a master for some plastics of Pegasi that were done for a German toy firm that never saw the light of day. Other than that the main unreleased stuff were WW2 vehicles for Black Tree. DW I will keep an eye out. 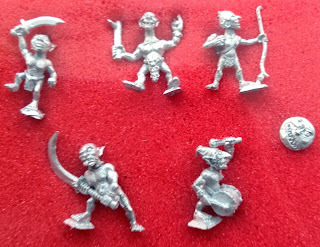 I managed to pick up a set of the Dwarf Juggernaut crew a few years but they were passed to a US friend who had the machine but no crew! Did you design the German staff car that was pictured at one point on the Harlequin 'to be released' page? I was so looking forward to that! TA Yes, a few were actually produced, but here were problems casting the body sides. It would have been a simple problem to cure, and I was going to make some modifications based on additional information I had acquired, but they never got around to fitting it into the mould making schedule. There was also a SdKfz7, an Opel Maultier, and a Russian 100mm AT gun that never saw the light of day. DW How did your relationship with Black Tree or Harlequin begin? TA We were all ex GW people. 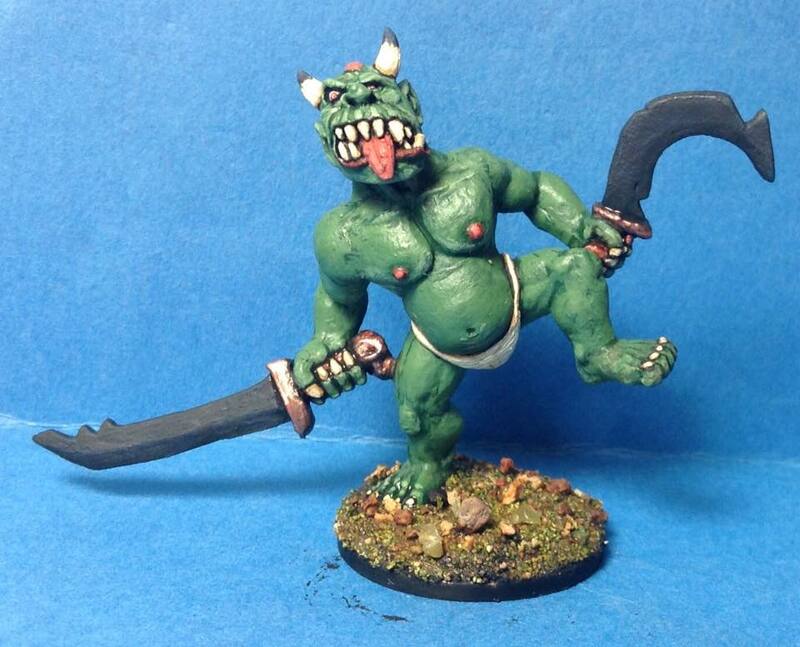 It's amazing just how many of the current miniatures company are full of ex GW folk. DW Have you thought of taking the sculpt to Sloppy Jalopy? It is certainly a vehicle I would buy! TA Blacktree own the masters so they won't be going to anyone else. Given the rise of plastic 1/48 WW2 scale kits by the likes of Tamiya then the Sloppy Jalopy guys and myself have decided to concentrate on WW1 and interwar vehicles. We are all into classic pulp fiction, and we will be doing some robots of that era. They will be be inspired more by the magazine illustrations of the era rather than the films. TA The Perrys did at least a couple of the robots, and I did the rest and all the bikes. The large scale figures were my first foray into doing human figures of that size. I had previously done some giants for Asgard but they could only loosely be described as human. There was a robot figure, but he became a "giant" robot in the regular 25mm Spacefarers range. This was around the time that Bryan left Asgard for Tabletop so that was the end of that project. DW At what point did you leave Games Workshop? TA It was 1991. Earlier GW created a subsidiary company called Flame Publications to produce RPG material. Its staff consisted of Graeme Davies, Mike Brunton, and myself. Graeme left to live in the US and Mike joined Microprose as a game designer. They were replaced by Robin Dews and Carl Sargeant but it had been pretty well decided to close the operation down. So it was back to the main studio where nothing really new was being developed. Part of the policy was the decision to target product at a younger audience, so things like Realm of Chaos were sidelined and then abandoned. So I resigned mainly due to boredom. DW That must have been quite a decision to make. Where did you move from there? TA Joined the dodgy world of freelancing. It would probably have been a good idea to have hung on for another couple of years given the financial climate. My main client for the first couple of years was Heartbreaker. 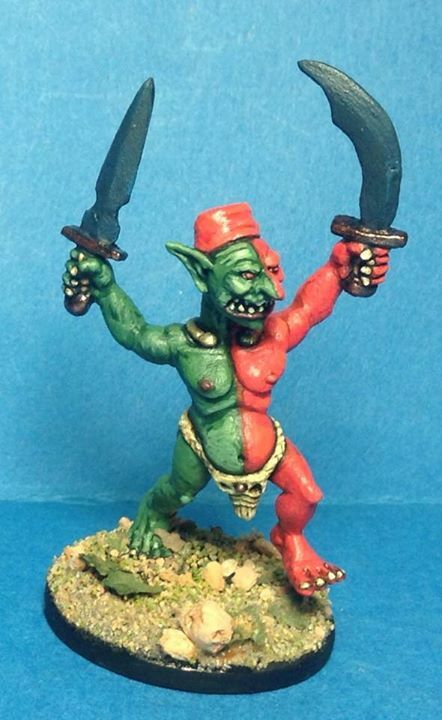 Does anybody know what happened to the original figure ranges? Scotia Grendel bought up the rights to the Leviathan range so they may know more? 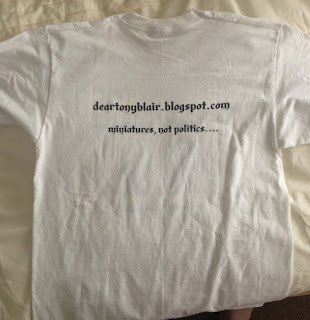 TA The catalogue is somewhat incomplete. The designer named ranges were a later development. They were taken over by Target Games as their miniatures manufacturer. It all gets complicated because Target later joined forces with John Robertson. 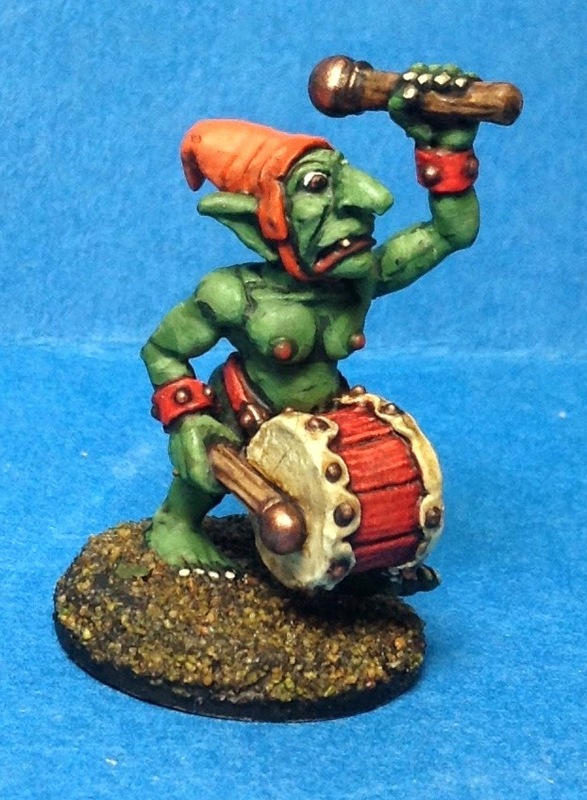 These days Scotia Grendel's main source of income seems to be contract casting for other miniature firms. DW Did you ever get involved in the mold making side of the business at all? TA No, one of the mould makers at Black Tree was going to show me how but neither of us ended up with enough time. I did master RTV moulds to create masters in the early days, but that seems to be almost exclusively used for resin these days. Done properly it is the safest way to produce masters but the curing time puts manufacturers off. DW Dean Carline of Unique Miniatures makes his own molds around each .figure.....very weird looking molds but the castings are very nice - very old school even though poured in like the Prince August molds. Did you ever meet up with the old school historical sculptors such as Peter Gilder or John Braithwaite? TA No, Bryan Ansell met Gilder. 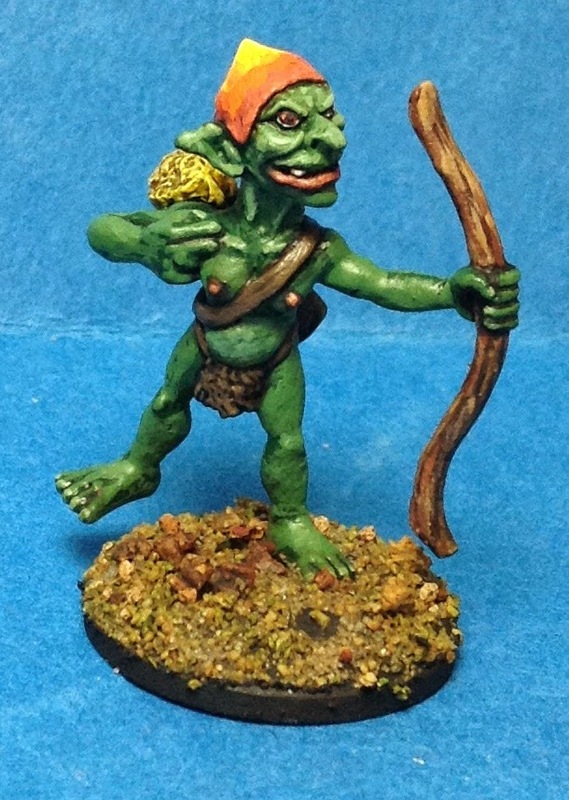 Interestingly enough the first successful sculpts I did were bought by Gilder. TA In collaboration with a friend of mine we did some French Cuirassiers. 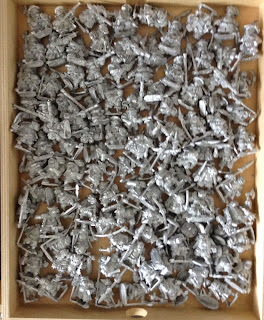 I hand cast a regiment, another friend took them to a show to sell and Gilder bought them. DW My first lead was Hinchliffe Late Byzantines, back in about 76' I think. I actually bought a bunch and painted them all.....that hasn't happened in a long time! I remember hearing about GW thinking of buying out Minifigs in the early 80s. Did you have any dealings with any of the other companies around at the time? TA No, after bumping into Bryan, there was as much work has I needed at that time. Like a lot of the sculptors back in that day I never looked on it as providing full time employment. 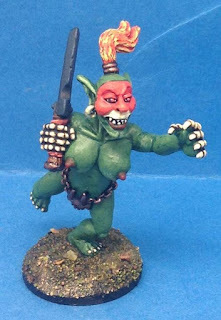 Fantasy miniatures were just beginning to take off then, and were looked down on by both Hinchliffe and Minifigs - although that never stopped them producing ranges. DW They did jump on the bandwagon for a while. Minifigs I thought progressed very well when they released the Valley of the Four Winds range.....a very different style in sculpting for them? TA There was a conversation between Neville Dickinson (Minifigs) and Phil Barker (WRG) printed in Military Modelling. Part of the conversation was devoted to attacking fantasy wargaming as a worthless pursuit. They carried on to say that as the miniatures were depicting things that were not real then the same standards were not required. 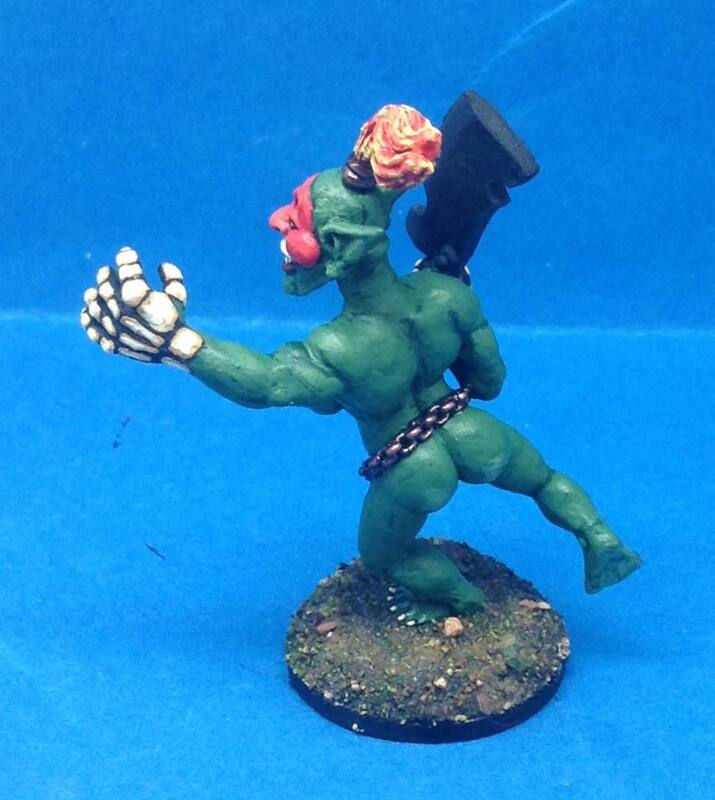 I think that sales of competitor’s fantasy figures against their own forced a change of outlook. There were certainly many others besides myself that believed that fantasy figures had to be better sculpted to be convincing. DW I think it took a long time before the established wargaming world grudgingly realised fantasy was here to stay....even then they didn't attack it with much gusto with the exception of the 2 later Minifigs ranges. Did you study art at college? TA Possibly best described as messing about in evening classes at a couple of the Schools of Art in Stoke. Back then if you lived in Stoke and became a professional artist it pretty well meant going into the ceramics industry, which is why I stayed an amateur for a long time. DW Do you have any favourite sculptors from back in the day? TA Tom Meier for his pure technical expertise which is still there. Blow up the image of one of Tom's figures and it looks like a larger scale figure. The Perrys when they are enthusiastic about a subject create a great illusion of detail. Nick Bibby on a good day, his Great Spined Dragon was a classic. DW What does the future hold if it can be revealed? TA Just doing whatever grabs my interest and creating pieces of artwork for their own sake. The benefits of being retired. DW Any pointers to budding artists / sculptors out there? 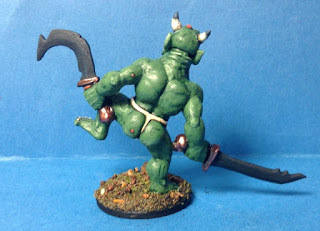 TA GW trained an awful lot of sculptors over the last few years and then let them go. The result is that there are a lot of technically competent sculptors out there. This just adds to the predominance of the Citadel style. How to create an alternative with a broad appeal is the problem. There are small companies that find a niche market, but a serious competitor to GW with a distinctive look is needed. It would have to create an equivalent to Warhammer as well, of course. Technology is also replacing traditional sculpting skills, GW are using computer modelling programs to create some of there plastics. If current trends continue sculptors will become more anonymous outside the very small companies. A lot of the best sculptors move into the toy market. 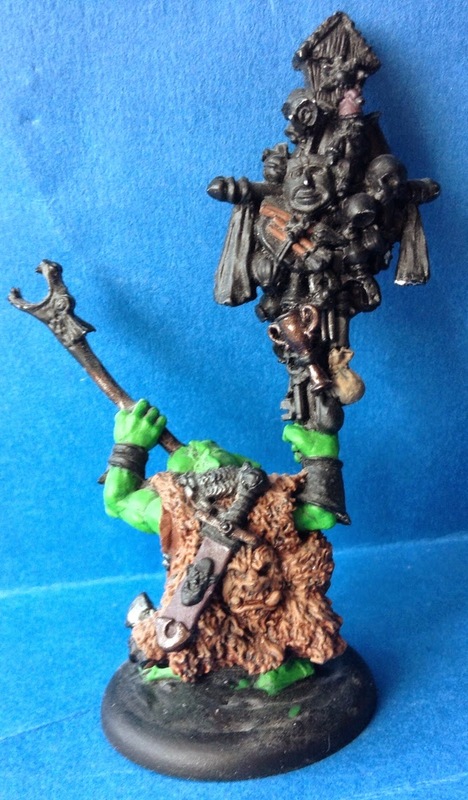 DW I think Mantic are attempting to copy the GW model and Warlord in the historical vein...not sure if either will actually compete in real terms though. Wargames Foundry seem to have gone off track at the moment, especially since 'falling out' with seemingly every sculptor under the sun? Not sure what their game plan is at the moment......I am guessing Bryan Ansell is concentrating on his property dealings etc. TA The last time I saw Bryan he told me he was leaving the running of Foundry to others to concentrate on Property dealing. That was just before I moved to Cornwall. Part of the problem with Foundry was that Bryan had unrealistic ambitions for the company. DW There seems to be a weird direction for Foundry at the moment - losing all the older ranges and releasing a lot of not so well sculpted replacements. I wonder if royalty payments are at the bottom of it? GW have jumped on a lot of companies regarding infringement and I foresee a lot more - they seems to be 'fair game' for some reason which is annoying as it slow down original creativity. I have been in contact with an old ceo of Heritage who said the cost of licences for them was a problem. GW have created their own worlds to such an extent that they deserve their success - although I sometimes look at the prices and shudder. TA The Warhammer world sort of largely evolved by accident. Initially (Warhammer) Battle was largely medieval whereas (Warhammer) Role Play was more Renaissance based. The two merged over time. Tom (Kirby) was the one who instigated the current litigious attitude of GW. I thought Bryan had bought the rights outright from the sculptors during the great falling out period, but being on the fringe I can't be sure. You would have to ask the Perrys, Buddle and the rest to be certain. DW Can I ask what you normally sculpt with? So many different putty types and tools out there! TA I started with Milliput, and for some larger figures I would still use it either on its own or just to create the major forms. I normally use Kneadatite (Green Putty) but intend to experiment with Pro Create which I have use on straight line work as a filler or for small details. DW Do you use any particular starting point for reference? Are you supplied with artwork for example? TA Depends on the figure. If it's based on an existing image then I obviously use the source material as a reference. Examples being the Raven figure based on the Achilleos cover. The right arm was altered simply because it is much too long in the original image, this is no that noticeable in the picture, but when translated into three dimensions it becomes obvious. The Cyclops I did for Black Tree was based the Harryhausen creature from "7tt Voyage of Sinbad" because that was what was requested. Strangely enough although I have created many more concepts for miniatures than I have actually sculpted myself I never use concepts for my own sculpts. I have a mental image of what I'm trying to create. I do use reference for non human anatomy, dress styles, wing structures etc. DW Did you sculpt the old Citadel Fiend Factory Emperor dragon? TA No, and I can't recall who did. It is easier to say who was not responsible. It was not Tom Meier, Nick Bibby, Jes Goodwin or the Perrys. I'm pretty certain it wasn't Aly Morrison either. So that cuts down the possible candidates, perhaps an early Trish Morrison? DW I was a very early sculpt, I had put it down to Bryan but I was googling the other day and an Italian website had put it down to you. Do you know if there ever was a sculptor at Citadel called Humphrey Leadbetter or similar? A lot of the very early sculpts are initialled HL. I've never known if he was 'real' or a pseudonym of sorts. TA The name is familiar. He might be the guy who communicated only by mail. Most of his stuff was done prior to the return of Bryan, and all his sculpts were replaced by one done by the Perrys. He may well have been hired to do stuff during the Duncan period. Both Bryan and Duncan's memories are dodgy on that period. The thing with that Dragon is the simplified wing structure, which precludes the designers I mentioned. Some stuff was accepted from Trish when she was still learning. Italians are probably getting confused with that Harryhausenesque Emperor Dragon. DW It's a nice old school sculpt anyway! 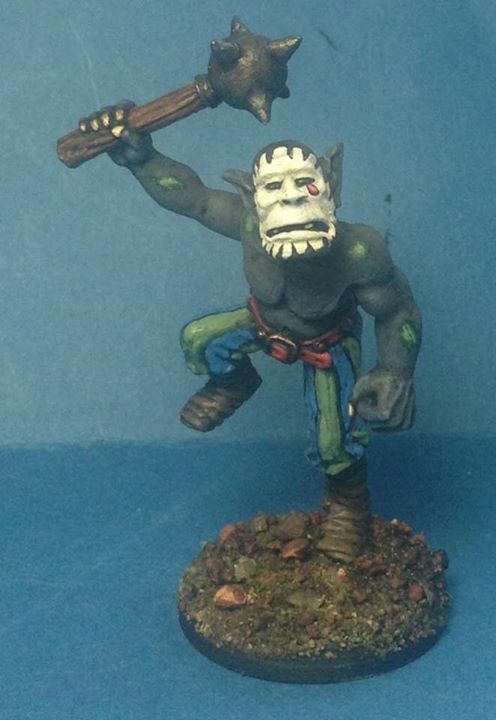 I often wish I could take a trip back there and have a look around what sculpts weren't released. There seem to be more un-released minis on ebay these days than released ones! 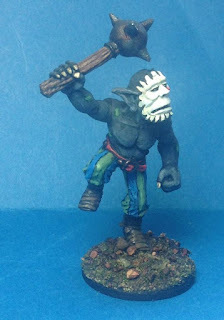 Just a quickie, the orcs for the old Citadel TA Orc War Machine - did you sculpt them yourself or were they Perry sculpts? TA They were Perry sculpts, to keep in style with the rest of the orcs. DW Many thanks for your time Tony, I look forward to seeing what the future brings from you!